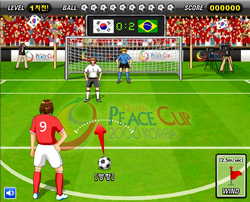 Description: A replica of the game of the World Cup in Korea and Japan in 2002, with the only difference being that who wins depends on you and your skills. In order to win, you do not need a lot of running around and exhausting. Sit back, focused and ... do not let our team lose! Description: Master footballer. For more tips, go ahead. 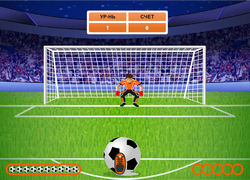 Description: Press space bar and break through penalty. 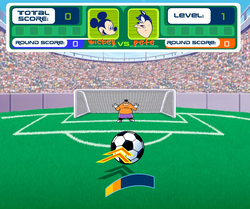 Description: Need to score 5 out of 10 penalties. Description: Select the direction of impact by a space, and then we beat a space. 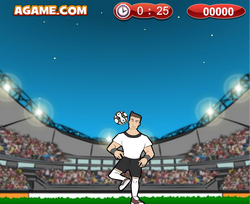 Description: Free kick to the wall, it is necessary to score 3 out of 10. Description: Alternately beat penalty to each other. Description: Free kick to the wall. Description: Play golf. Do not know how? Then learn to play golf. Description: Golf, view from above. 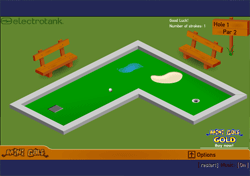 Description: Golf, where the player can not see, because it's you.